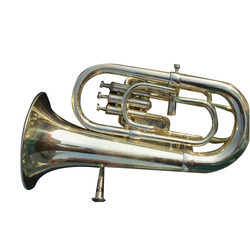 As a certified organization, we are successfully meeting the wide requirements of our clients by manufacturing and trading high quality range of Euphonium 4 Valve Horn. - Extensively used in marching band. 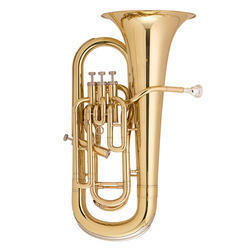 We are one of the most reliable companies in this domain and are into offering Musical Euphonium. We bring forth vast industrial experience and expertise in this business, instrumental in providing Musical Euphonium. Our clients can avail from us a wide collection of best quality Musical Euphonium at very affordable rates which is used in various fields. We are a credible market choice occupied in the business of offering to our customers a world class collection of Musical Euphonium. This is a beautiful 3 Valve Bb Euphonium in BLUE & BRASS COLOUR finish. Euphonium is a great value for money. A mouthpiece and a carry bag is also included.